To provide scholarship assistance to employees of the Westmoreland Club, their children and grandchildren. To assist qualified charitable community organizations providing educational, health and guidance assistance to children and youth. To provide programs to educate the public on the history of the community through lectures and tours using the portraits of prominent community leaders on display in The Westmoreland Club and to foster public understanding of, and appreciation for, the rich heritage of the community. To support historic preservation activities in the community including the maintenance of the exterior structure of The Westmoreland Club. The Westmoreland Club Charitable Foundation is prepared to accept monetary contributions from members or in-kind donations subject to art acceptance guidelines specified in the Art Acquisition Policy of the Foundation, which may be in the form of a one-time gift, an annual pledge, or part of your estate plan and can be treated as deductible charitable contributions. Monetary contributions will be deposited into a fund, with expenditures managed by the Foundation’s Board of Directors in accordance with qualifying purposes and donor restrictions. Contributors will be recognized in Westmoreland Club publications. Donated art with be labeled to identify contributors and will be exhibited with the Foundation collection. Donations in memory of deceased family members or in honor of significant family events such as birthdays and anniversaries are encouraged and will be appropriately recognized. Pictured above from left to right… CASA Executive Director John Aciukewicz, Esq., Westmoreland Club Charitable Foundation President Christopher Barbarevech, M.D., CASA Board Member Melissa Parente, CASA Board Member Christina Taylor, CASA Board Member Kathleen Hirthler, Westmoreland Club Charitable Foundation Secretary/Treasurer Jack Weinberg and Westmoreland Club General Manager/COO Robert L. Williams, CCM, CEC. The Westmoreland Club Charitable Foundation recently provided a donation of $4,000 for Court Appointed Special Advocates (CASA) of Luzerne County. 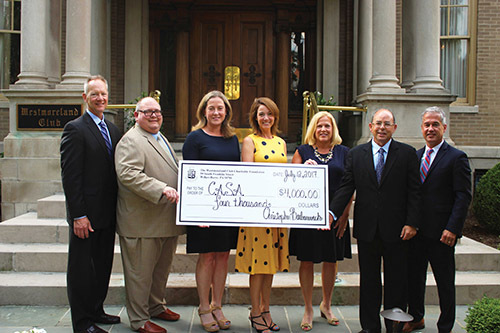 The check was presented to support a CASA initiative to undertake a comprehensive strategic planning process in order to recruit, select, train, and support additional volunteer advocates. The organization provides advocacy for children in Luzerne County who have suffered abuse and/or neglect to ensure their placement in safe, secure, and nurturing homes as soon as possible. One of the purposes of the Westmoreland Club Charitable Foundation is to assist qualified charitable community organizations that assist children and youth. Court Appointed Special Advocates (CASA) for Children is a network of nearly 1,000 community-based programs that recruit, train, and support citizen-volunteers to advocate for the best interests of abused and neglected children in courtrooms and communities. Volunteer advocates—empowered directly by the courts—offer judges the critical information they need to ensure that each child’s rights and needs are being attended to while in foster care. Volunteers stay with children until they are placed in safe and secure permanent homes. For many abused children, a CASA volunteer is the only constant adult presence in their lives. A milestone in the history of The Westmoreland Club was reached when the Board of Governors designated a room on the second floor as the Edward Welles, Jr. Library and Heritage Center. The project was undertaken by the Historical and Library Committee in furtherance of its mission to promote the heritage of the Club and local history. Under the direction of The Westmoreland Club Charitable Foundation, a bequest from the Estate of Virginia C.Welles provided an extensive collection of literary and historical works. This was enhanced by a donation of a number of portraits of several generations of the Welles family now hanging in the library. The Foundation commissioned the construction of a magnificent bookcase exhibit cabinet to house the library collection. The cabinet also serves as the display for the World War I Memorial plaque and the Veterans Book. Space is provided for the display of artifacts related to the history of the Club in lighted exhibit cases. 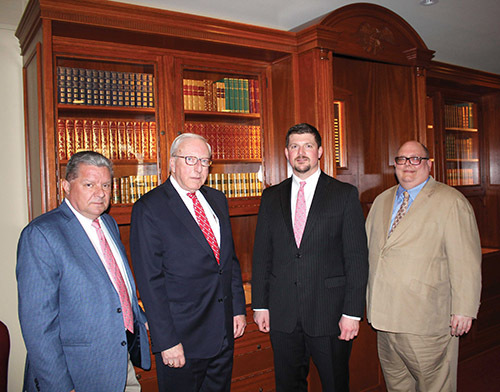 Pictured left to right: Westmoreland Club President George G. Conyngham, Jr., Historical and Library Committee Chairman Stephen B. Killian, Historical and Library Committee Co-Chairman Daniel Volpetti, and Charitable Foundation President Christopher Barbarevech.